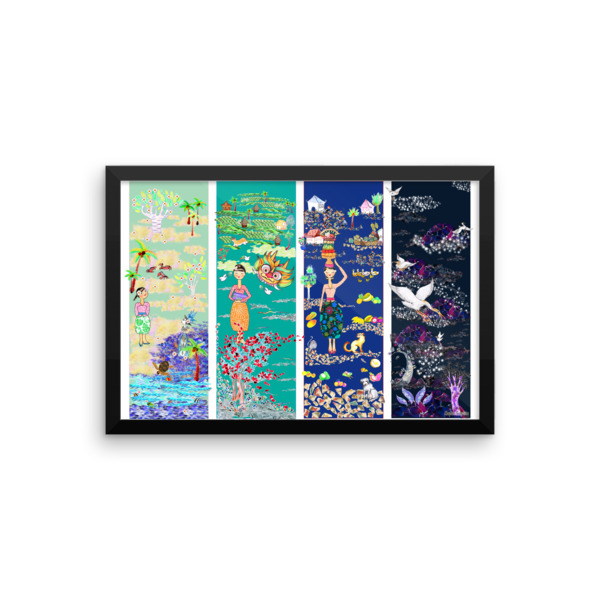 This poster is a four panels fairy tale about Bali. Once upon a time, a little girl met the Queen of the Seas. She recommended her to treat human, animals, plants, stones and spirits with equal respect, and to always stay humble. The little girl grew up, and resisted many temptations, like to be materialistic or to become selfish. She became a very compassionate woman and cared for any living creature that she would meet. Finally, when she died, she got reincarnated into a beautiful white heron, and lived freely in the sky. I lived in Bali for almost three years. I love the atmosphere of this island, the daily ceremonies, the delicious food and the beautiful sky. But this island is not only beautiful: it has a special effect on the soul. I became a vegetarian when I came to live in Bali, I think this island made me more compassionate and conscious about the suffering of others. In Bali, there are many stray animals wandering the streets, I found my cat Mimpi that way. I believe that Bali has a special atmosphere that makes you feel more conscious about respect. This poster would be nice in a child’s room, as it is a life metaphor about growing up. The colors are very soft, with warm tones of grean and blue. This poster is part of a series of fairy tales, “Once upon a time” around the world: check also “Once upon a time in Paris” in France, and “Once upon a time in Kyoto” in Japan. These three prints were featured in an exhibition in Kyoto, Japan, in march 2015. When they are put together, they look like a rainbow!